On October 26 on a rainy afternoon, six adult lake sturgeon, including a female over 5 feet long, were released into the Milwaukee River at the end of Concordia Avenue in Riverwest. This is part of a ongoing effort to reintroduce this magnificent and ancient species to the river and Lake Michigan. “The stocking is a testament to the resurrection of a river not long ago given up for dead…” said Brad Eggold, Wisconsin Department of Natural Resources fisheries team supervisor. Eggold adds, the stocking “signifies to a great extent the work that’s been done in the Milwaukee River watershed to clean up pollution and to remove dams that blocked the fish’s passage, most importantly the removal of the North Avenue Dam in 1997. The progress makes the return of the sturgeon possible after more than 100 years.” Lake sturgeon can grow to over 100 pounds and live 100 years. The record size for Wisconsin is 170 pounds 10 ounces and 79 inches long, caught in Lake Michigan in 1979. Reproduction of the species is complicated by the fact the female has to reach the age of 20 to 25 before spawning. As part of the project, 200 young fingerling sturgeon with an average length of 10 inches were released upstream in June of this year. 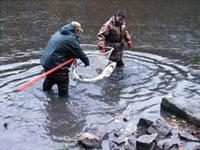 The adult/juvenile lake sturgeon released on October 26th were captured from the Wolf River. These larger fish have had radio transmitters implanted inside their bodies to track their movement in the River. The photo shows a DNR worker checking for a tracking signal immediately after the release of the fish. The project is funded, in part, by a grant from the National Marine Fisheries Service and a contribution by the Milwaukee River Revitalization Council. Fred Binkowski, a scientist with the UWM WATER Institue, said the stocking was another feather in the cap of a state management program regarded as an international model. Today, 30 species of fish have been documented in the Milwaukee River, including the Greater redhorse, a state threatened species. Under suitable flow conditions, trout and salmon have migrated about 30 miles upstream to the Village of Grafton and Cedarburg on Cedar Creek. “It will be great to add the lake sturgeon to this list,” Eggold said.